As you may have noticed, we’ve been going a little crazy over all things Kiwi these past few weeks, (I mean, more crazy than we usually go of course). As well as giving you some awesome deals on trips to New Zealand, we’ve also been hearing why a couple of our very own STA Travel staffer’s here in the UK, have decided it’s time to move to New Zealand. And now, we hear from a real life Kiwi about why she loves her homeland. Meet Sarah Bedford, she’s 29, lives in Auckland, and works as Marketing Manager for STA Travel New Zealand (dream job alert!) and is as Kiwi as the All Blacks or L&P. Here's Sarah, but um, what is she eating?!! I’ve been in touch to grill her on what she thinks makes New Zealand so great, and have got her to tell us about what life in New Zealand has to offer in the way only a true Kiwi can. Sarah’s Tips For Living New Zealand Life Like A Local. Hey Sarah, so are you a Kiwi born and bred? Yep. I originally come from a small town called Te Awamutu, also known as the Rose Town, which is a farming community in the North Island. If you’ve heard of the Finn brothers from the band ‘Crowded House’ (famous in the 80s), they’re from there too! I moved up to the big smoke (i.e. Auckland) when I was eight. Where’s your favourite place in New Zealand? 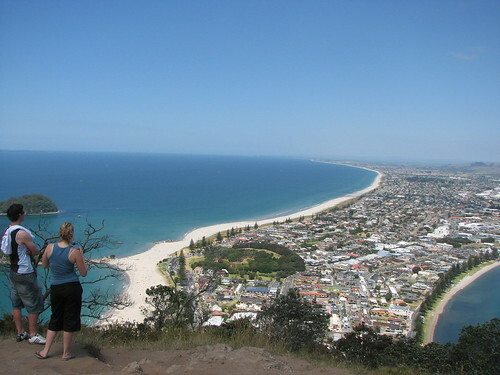 My easy favourite is Mt Maunganui (for you poms it’s pronounced ‘mon-ga-noo-ee’), a beach town in the Bay of Plenty, North Island. Spend the day at the beach sunbathing or surfing (there is even a man-made reef), walk around the mount itself in the afternoon before rewarding yourself with a dip in the hot pools at the base in the early evening. After all that’s done, get a legendary ice cream from Copenhagen Cones across the road. What do you think is so great about New Zealand? New Zealand is known for its many landscapes, you can be at the beach, the snow, the mountains or the city in a short space of time. I personally love the beach lifestyle in New Zealand and the laidback attitude. I love the summers in New Zealand when it’s still light in the evenings, and you can kick back on the deck with a beer or glass of wine. Bliss. What’s your idea of a great Saturday night out on the town? I’m a fan of the viaduct area in Auckland which is on the waterfront (great views! ), and home to a huge choice of places to eat, drink and dance. Ponsonby Road is also a nightlife winner, with a stretch of bars and restaurants to suit all tastes. What’s the tipple of choice for a great Kiwi night out? Two popular kiwi-brewed beers are Steinlager or Monteith’s. We also have a raft of New Zealand wines from the regions of Marlborough, Hawkes Bay, Central Otago and Martinborough to name just a few. My recommendation? Try them all! Can you tell us a couple of Kiwi sayings to help us fit in and talk like a local? Chilly bin – also known as ‘esky’ by the Aussies or perhaps you’ll have heard the term ‘cooler’. Essentially a place to keep your food and drinks cold. Bach (pronounced ‘batch’) – a holiday home by the beach. Dairy – the corner shop selling drinks, ice cream, magazines etc. Hangi – traditional Maori technique of cooking food underground using red hot rocks and steam. Bring a plate – something you do at a BBQ, don’t literally bring an empty plate, it means bring a plate of food to share. What are all the cool Kiwi’s wearing at the moment? Kiwis are a pretty laid back bunch so jeans are at the top of the list, full length in winter and cut offs in the summer. 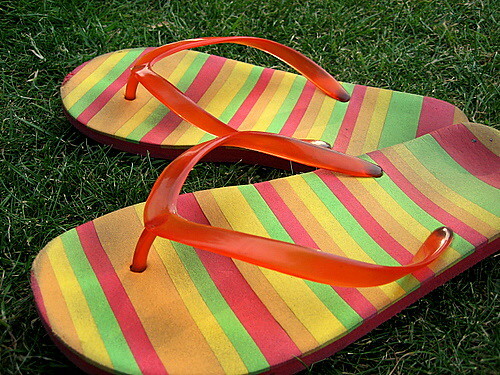 Regulation footwear – jandals. What bands from New Zealand are you listening to right now? Kimbra is so hot right now, as well as Kids of 88 and old favourites like Shapeshifter. You’re guaranteed to find a great local bar hosting a live band wherever you go, just keep an eye on their upcoming gigs. New Year’s Eve is a bumper time to get your NZ music fix such as at the Coromandel Gold Festival in Whitianga or Rhythm ‘n Vines down in Gisborne. What are New Zealander’s favourite passions and where would we go to experience them? The kiwi passion goes beyond passion and more into obsession, for the game of rugby. The obsession reached fever pitch last year when the mighty All Blacks were crowned World cup champions! Rugby is played all over the country but no ground is more synonymous with the All Blacks than Eden Park in Auckland. Be sure to go to a game, and don’t forget to wear black! Where could we go to find out about Maori culture? Maori culture is a big part of New Zealand culture, it defines its people and its history. The cultural heart of Maori culture is in Waitangi, Northland, where the Treaty of Waitangi was signed in 1840. Rotorua is also a great place to experience Maori culture firsthand, as well as being a hub for activities like sky diving, the luge, rafting, zorbing and heaps more. You also have the chance to get up close to our geothermal lakes and geysers. Where have you travelled outside of New Zealand? I moved to Thailand when I was 16 and lived the expat life in Bangkok, quite an eye-opener coming from NZ! I returned home for university and made do with regular visits to Thailand (to see the parents, who live there still) before heading off to live in London for a few years. From there I visited Scotland and Wales, and did a two month Europe stint in a converted minibus with seven other friends covering France, Spain, Italy, Croatia, Belgium, Austria, Germany and the Netherlands. I’ve also been to Malaysia, Singapore, Vietnam, Indonesia and of course Australia. I’m yet to tick off the Americas and Africa (and hopefully one day, Antarctica!) but hope to in the next few years. My next trip is to Fiji.